Abstract: Migratory flows have globalized Chagas disease and have contributed to change its epidemiology. Additionally, Chagas disease has a great impact on the affected people as well as on the economy of their countries. However, till now, this disease remains a neglected disease. Historically, very few resources have been invested to study Chagas disease or to provide care to the millions of affected people. In Latin America, the endemic countries still have several challenges ahead, which include care for the affected people, the effective control of vertical transmission, or the maintenance of vector control. In nonendemic countries where the disease is emerging, care for patients and the control programs for blood banks, organ transplant, and mother-to-child transmission should be the priorities. In most cases, the immune response of the host is not enough to eradicate the parasite. Therefore, a vaccine in order to reinforce immune response to the parasite has been proposed, but it is still in the early stages of development. The parasite plays a fundamental role in the genesis and development of lesions in the host, inducing cell lysis, an inflammatory response, and fibrosis. The inflammatory reaction is intense during the acute phase, then lower, but maintained, in the chronic phase of the infection.9 The initial inflammatory response is a result of the rupture of infected cells that release a great amount of proinflammatory trypomastigotes and parasitic molecules, dead parasites, and cellular waste.10 Cellular lesions primarily affect muscle cells (myocytolysis) and nerve cells (autonomic neuronal denervation)11,12 producing megaviscera. Recent results show that cardiac and digestive lesions are preferably observed in patients with few regulatory T-lymphocytes (CD4+CD25+h) capable of limiting cytotoxic mechanisms that depend on CD8+ T-cells.12,13 Fibrosis develops more intensely in chronic Chagas heart disease than in any other etiology, as a poorly vascularized collagen neoformation of difficult regression. Regarding clinical stages of the disease, after the acute clinical phase, in which only a low percentage of the infected people have enough clinical symptoms to be detected and treated, the infection becomes chronic. People are usually asymptomatic for many years. However, 30%–40% of the chronically infected people develop symptoms several years after infection. The development of clinical symptoms is gradual and paucisymptomatic at first. 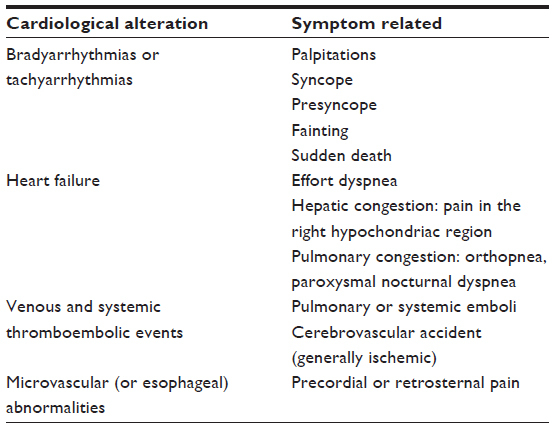 The heart, the digestive tract, and, to a lesser extent, the central nervous system (CNS) are the main involved organs or systems presenting clinical disease.18,19 The main clinical symptoms affecting infected people are described in Tables 1 and 2. The chronicity of the infection is one of the key factors that explain the spread of the disease beyond the Americas. Moreover, the slow development of symptoms years after the infection and the nonspecificity of these symptoms make CD difficult to be diagnosed in early stages of the infection. The spread and globalization of T. cruzi infection and its introduction to nonendemic countries oblige the recipient countries to attend several challenges of public health concern, mainly referred to the care of infected people and the control of transmission. The transmission of T. cruzi to humans can occur through several ways: by vector transmission (the main form of intradomiciliary transmission), oral transmission (contaminated food and drinks), blood transfusion, organ transplants, mother-to-child transmission, and accidental infection in laboratories. Among them, only vector and oral transmission are restricted to traditionally endemic areas. Vector transmission: Vector transmission is a result of depositing infected metacyclic trypomastigotes found in the droppings of triatomines on the cracked skin and/or mucous membranes of human beings or animals. The parasite goes through the host’s tissues reaching peripheral blood and is spread by the host. Organ transplantation: A common practice implemented in the last decades, is also a potential way of T. cruzi transmission in both endemic and in nonendemic countries that receive Latin American migration. Other transmission ways: Laboratory accidents and other such ways of transmission, have minor epidemiological relevance. History compatible with the epidemiology of the disease, regarding possibility of having acquired the infection. Laboratory diagnosis: individuals are considered to be infected when they have a positive result in parasitological tests or two positive results with two serologic techniques that employ different antigens. It is estimated that every year 2% of chronically infected people start to develop heart or digestive tract complications.44 Regarding the diagnosis of the organ involvement in case of chronic stages of the disease, specific studies of cardiac and digestive organs are necessary. An electrocardiogram, echocardiography, and chest X-Ray are the basis of cardiologic involvement diagnosis. Other studies as 24-hour Holter monitoring, electrophysiologic study, ergometry, or cardiac catheterization could be employed following the symptomatology of each patient. Radiological tests such as abdominal X- ray, barium swallow, and barium enema are used to determine if there are digestive complications. The management of CD should be focused in two aspects: the antiparasitic treatment in order to eradicate or diminish the parasite burden and the management of organ complications. The regime of BZD in children should be indicated with an 8–10 mg/kg daily dose in two or three divided doses for 60 days, and for adults, with a 5 mg/kg daily dose. NFX should be prescribed at a dose of 15 mg/kg daily in three divided doses for 60–90 days for children and 8–10 mg/kg daily for adults. Both drugs must be administered after meals. BZD is the most used drug, due to its widespread availability. Both drugs have common adverse drugs reactions (ADRs) and cause dermatological, digestive, neurological (most frequent with NFX), articular, and general symptoms like asthenia, anorexia, and fever.51–53 Only 5% of the ADRs are severe, and the mild and moderate ADRs could be well managed with symptomatic treatment. 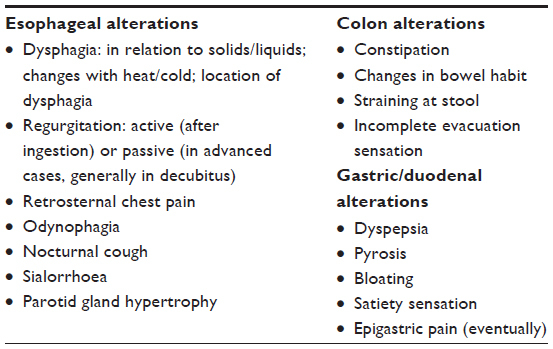 In order to better manage the presence of ADRs, a close follow-up of patients under treatment should be performed. Today, new drugs as posaconazole (POS), pro-ravuconazole, or fexinidazole have been recently tested or are currently under investigation.55,56 Until now, these drugs have shown that they are not useful as unique drugs for the treatment of CD at the doses proposed. On the other hand, the early diagnosis of heart or intestinal damage leads to early management and control of the clinical features derived from CD. For this purpose, several biomarkers (myocardial damage as diastolic dysfunction, natriuretic peptides, and troponins63,64) and certain complementary techniques(cardiac magnetic resonance65,66 or esophageal manometry67–69) have been proposed in selected cases. During the last decades, vector control has been reinforced with excellent results73, and, currently, the challenge is to give continuity to vector control measures in order to avoid the possibility of resurgence of vector-borne transmission in regions where it is already successfully controlled. The situation in the US deserves a specific comment. Although in 27 states of the country eleven species of triatominae have been detected, and many of them are parasitized by T. cruzi, the risk of transmission of the parasite to humans is very low.74 Only few autochthonous human cases of CD have been reported in the US. This is possibly due to the higher standard of housing construction and the low level of contact between kissing bugs and humans. Due to the high efficacy of specific T. cruzi treatment in newborns (close to 100%) and the cost-effectiveness of these control programs,84 they should be implemented in all the affected countries to screen pregnant women coming from endemic areas, with the objective to give early treatment to the infected newborns. Control programs in blood banks have achieved good results in endemic countries.81 Several studies have assessed the risk of transmission in maternity wards and blood banks in nonendemic countries. Regarding blood transmission, studies in Spain, the US, and other countries have shown a risk of transmission ranging from 0.62% to 5%79–82,87–91 Universal blood donation screening for T. cruzi began in 2005 in Spain and in 2007 in the US. Up to now, in Europe, only four more countries (France, Switzerland, UK, and Sweden) have implemented clear and effective measures to control risk of CD via blood transfusion. In the US, systematic screening for people at risk has been mandatory since 2010. The measures to control blood transmission in other countries like Australia and Japan have been mainly based on questionnaires to assess T. cruzi transmission risk. Overall, for the control of T. cruzi transmission in both endemic and nonendemic countries, it is mandatory to modify public health policies in blood banks, maternity wards, and in the transplant programs. Nowadays, CD is still a neglected disease and a public health problem in both endemic and nonendemic countries. Health systems worldwide should be prepared to give response in order to avoid new cases of the infection by preventive measures, and to have better tools to manage patients at different stages of the disease. Global collaboration and research on new tools to improve diagnosis, treatment, and control measures should be supported and reinforced. Several initiatives have started to define priorities and milestones to improve the situation of neglected CD patients.92,93 In 2012, a community of international partners endorsed the London Declaration on Neglected Tropical Diseases,92 demanding coordinated efforts to eliminate or control 10 neglected tropical diseases, including CD. In 2013, The Global Chagas Disease Coalition was launched.94 This is an open collaborative alliance that aims to facilitate the access to existing tools for the affected individuals in order to improve their condition. It also calls for a new R&D agenda and for strengthening control programs in endemic and nonendemic countries. ISGLOBAL Research group receives funds from the Agència de Gestió d’Ajuts Universitaris i de Recerca (AGAUR), grant number 2014SGR26, and from the Tropical Disease Cooperative Research Network (RICET), grant number RD12/0018/0010. Gascon J, Bern C, Pinazo MJ. Chagas disease in Spain, the United States and other non-endemic countries. Acta Trop. 2010;115:22–27. Hotez PJ, Molyneux DH, Fenwick A, et al. Control of neglected tropical diseases. N Engl J Med. 2007;357:1018–1027. Lee BY, Bacon KM, Bottazzi ME, Hotez PJ. Global economic burden of Chagas disease: a computational simulation model. Lancet Infect Dis. 2013;1:342–348. Noireau F, Diosque P, Jansen AM. Trypanosoma cruzi: adaptation to its vectors and its hosts. Vet Res. 2009;40,26. Gurtler RE, Cecere MC, Lauricella MA, Cardinal MV, Kitron U, Cohen JE. Domestic dogs and cats as sources of Trypanosoma cruzi infection in rural northwestern Argentina. Parasitology. 2007;134:69–82. Zingales B, Andrade SG, Briones MR, et al. A new consensus for Trypanosoma cruzi intraspecific nomenclature: second revision meeting recommends TcI to TcVI. Mem Inst Oswaldo Cruz. 2009;104:1051–1054. Tomlinson S, Raper J. Natural human immunity to trypanosomes. Parasitol Today. 1998;14:354–359. Truyens C, Carlier Y. Protective host response to parasite and its limitations. In: Telleria J, Tibayrenc M, editors. American Trypanosomiais. Chagas Disease. One Hundred Years of Research. London, UK: Elsevier; 2010:601–642. Andrade ZA. Patologia da Doença de Chagas. In: Brener Z, Andrade ZA, Barral-Netto M, editors. Trypanosoma Cruzi e Doença de Chagas. Rio de Janeiro, Brazil: Guanabara Koogan S/A; 2010:201–230. Almeida IC, Camargo MM, Procopio DO, et al. Highly purified glycosylphosphatidylinositols from Trypanosoma cruzi are potent proinflammatory agents. EMBO J. 2000;19:1476–1485. Koberle F. Chagas’ disease and Chagas’ syndromes: the pathology of American trypanosomiasis. Adv Parasitol. 1968;6:63–116. Lázzari JO. Autonomic nervous system alterations in Chagas’ disease: review of the litterature. In: Pan American Health Organization, editors. Chagas’ Disease and the Nervous System. Washington, DC: PAHO; 1994. Vitelli-Avelar DM, Sathler-Avelar R, Dias, JC, et al. Chagasic patients with indeterminate clinical form of the disease have high frequencies of circulating CD3+CD16-CD56+ natural killer T cells and CD4+CD25high regulatory T lymphocytes. Scand J Immunol. 2005;62:297–308. Kierszenbaum F. Chagas’ disease and the autoimmunity hypothesis. Clin Microbiol Rev. 1999;12:210–223. Cunha-Neto E, Teixeira PC, Nogueira LG, Kalil J. Autoimmunity. Adv Parasitol. 2011;76:129–152. Kierszenbaum F. Where do we stand on the autoimmunity hypothesis of Chagas disease? Trends Parasitol. 2005;21:513–516. Viotti R, Alarcon de Noya B, Araujo-Jorge T, et al. Towards a paradigm shift in the treatment of chronic Chagas disease. Antimicrob Agents Chemother. 2014;58(2):635–639. Vitelli-Avelar DM, Sathler-Avelar R, Massara RL, et al. Are increased frequency of macrophage-like and natural killer (NK) cells, together with high levels of NKT and CD4+CD25high T cells balancing activated CD8+ T cells, the key to control Chagas’ disease morbidity? Clin Exp Immunol. 2006;145:81–92. Rassi A Jr, Rassi A, Marin-Neto JA. Chagas disease. Lancet. 2010;375:1388–1402. Carod-Artal FJ, Gascon J. Chagas disease and stroke. Lancet Neurol. 2010;9(5):533–542. Guhl F, Jaramillo C, Vallejo GA, et al. Isolation of Trypanosoma cruzi DNA in 4,000-year-old mummified human tissue from northern Chile. Am J Phys Anthropol. 1999;108:401–407. Bern C, Montgomery SP. An estimate of the burden of Chagas disease in the United States. Clin Infect Dis. 2009;49:e52–e54. Medrano-Mercado N, Ugarte-Fernandez R, Butron V, et al. Urban transmission of Chagas disease in Cochabamba, Bolivia. Mem Inst Oswaldo Cruz. 2008;103:423–430. Guhl F, Pinto N, Aguilera G. Sylvatic triatominae: a new challenge in vector control transmission. Mem Inst Oswaldo Cruz. 2009;104(1):71–75. Moncayo A, Silveira AC. Current epidemiological trends for Chagas disease in Latin America and future challenges in epidemiology, surveillance and health policy. Mem Inst Oswaldo Cruz. 2009;104(1):17–30. Schmunis GA. Epidemiology of Chagas disease in non-endemic countries: the role of international migration. Mem Inst Oswaldo Cruz. 2007; 102(1):75–85. Jackson Y, Varcher Herrera M, Gascon J. Economic crisis and increased immigrant mobility: new challenges in managing Chagas disease in Europe. Bull World Health Organ. 2014;92(10):771–772. Pan American Health Organization (PAHO). Estimación cuantitativa de la enfermedad de Chagas en las Americas. Montevideo, Uruguay: PAHO; 2006. Basile L, Jansa JM, Carlier Y, et al. Chagas disease in European countries: the challenge of a surveillance system. Euro Surveill. 2011;16(37). pii: 19968. Guerri-Guttenberg RA, Grana DR, Ambrosio G, Milei J. Chagas cardiomyopathy: Europe is not spared! Eur Heart J. 2008;29:2587–2591. da Silva Valente SA, de Costa Valente V, Neto HF. Considerations on the epidemiology and transmission of Chagas disease in the Brazilian Amazon. Mem Inst Oswaldo Cruz. 1999;94(1):395–398. Dias JCP. Epidemiologia. In: Brener Z, Andrade ZA, Barral-Netto M, editors. Trypanosoma Cruzi e Doença de Chagas. Rio de Janeiro, Brazil: Guanabara Koogan S/A; 2000:48–74. Schmunis GA. A Tripanossomíase Americana e seu Impacto na Saúde Pública das America. In: Brener Z, Andrade ZA, Barral-Netto M, editors. Trypanosoma Cruzi e Doença de Chagas. Rio de Janeiro, Brazil: Guanabara Koogan S/A; 2000:1–15. Carlier Y, Torrico F. Congenital infection with Trypanosoma cruzi: from mechanisms of transmission to strategies for diagnosis and control. Rev Soc Bras Med Trop. 2003;36:767–771. Fernandez-Aguilar S, Lambot MA, Torrico F, et al. Placental lesions in human Trypanosoma cruzi infection. Rev Soc Bras Med Trop. 2005; 38(2):84–86. World Health Organization (WHO). Control of Chagas’ Disease. Geneva, Switzerland: WHO; 2002:1–109. Luquetti AO, Rassi A. Diagnóstico laboratorial da infeccao pelo Trypanosoma cruzi. In: Brener Z, Andrade ZA, Barral-Netto M, editors. Trypanosoma Cruzi e Doença de Chagas. Rio de Janeiro, Brazil: Guanabara Koogan S/A; 2000:344–378. Gomes YM, Lorena VM, Luquetti AO. Diagnosis of Chagas disease: what has been achieved? What remains to be done with regard to diagnosis and follow up studies? Mem Inst Oswaldo Cruz. 2009;104(1):115–121. Brasil PE, De Castro L, Hasslocher-Moreno AM, et al. ELISA versus PCR for diagnosis of chronic Chagas disease: systematic review and meta-analysis. BMC Infect Dis. 2010;25;10:337. Schijman AG, Bisio M, Orellana L, et al. International study to evaluate PCR methods for detection of Trypanosoma cruzi DNA in blood samples from Chagas disease patients. PLoS Negl Trop Dis. 2011;5:e931. Murcia L, Carrilero B, Muñoz MJ, Iborra MA, Segovia M. Usefulness of PCR for monitoring benznidazole response in patients with chronic Chagas’ disease: a prospective study in a non-disease-endemic country. J Antimicrob Chemother. 2010;65(8):1759–1764. Pinazo MJ, Miranda B, Rodríguez-Villar C, et al. Recommendations for management of Chagas disease in organ and hematopoietic tissue transplantation programs in nonendemic areas. Transplant Rev. 2011; 25(3):91–101. Burgos JM, Altcheh J, Petrucelli N, et al. Molecular diagnosis and treatment monitoring of congenital transmission of Trypanosoma cruzi to twins of a triplet delivery. Diagn Microbiol Infect Dis. 2009;65(1):58–61. Prata A. Clinical and epidemiological aspects of Chagas disease. Lancet Infect Dis. 2001;1:92–100. Bern C, Montgomery SP, Herwaldt BL, et al. Evaluation and treatment of chagas disease in the United States: a systematic review. JAMA. 2007;298:2171–2181. Schijman AG, Altcheh J, Burgos JM, et al. Aetiological treatment of congenital Chagas’ disease diagnosed and monitored by the polymerase chain reaction. J Antimicrob Chemother. 2003;52:441–449. Sosa Estani S, Segura EL, Ruiz AM, Velazquez E, Porcel BM, Yampotis C. Efficacy of chemotherapy with benznidazole in children in the indeterminate phase of Chagas’ disease. Am J Trop Med Hyg. 1998;59:526–529. Viotti R, Vigliano C, Lococo B, et al. Long-term cardiac outcomes of treating chronic Chagas disease with benznidazole versus no treatment: a nonrandomized trial. Ann Intern Med. 2006;144:724–734. Marin-Neto JA, Rassi A Jr, Avezum A Jr, et al; BENEFIT Investigators. The BENEFIT trial: testing the hypothesis that trypanocidal therapy is beneficial for patients with chronic Chagas heart disease. Mem Inst Oswaldo Cruz. 2009;104(Suppl 1):319–324. Fabbro DL, Danesi E, Olivera V, et al. Trypanocide treatment of women infected with Trypanosoma cruzi and its effect on preventing congenital Chagas. PLoS Negl Trop Dis. 2014;8(11):e3312. Pinazo MJ, Munoz J, Posada E, et al. Tolerance of benznidazole in treatment of Chagas’ disease in adults. Antimicrob Agents Chemother. 2010;54:4896–4899. Sosa-Estani S, Segura EL. Etiological treatment in patients infected by Trypanosoma cruzi: experiences in Argentina. Curr Opin Infect Dis. 2006;19:583–587. Jackson Y, Alirol E, Getaz L, Wolff H, Combescure C, Chappuis F. Tolerance and safety of nifurtimox in patients with chronic Chagas disease. Clin Infect Dis. 2010;51(10):e69–e75. Buckner FS. Sterol 14-demethylase inhibitors for Trypanosoma cruzi infections. Adv Exp Med Biol. 2008;625:61–80. Molina I, Gómez i Prat J, Salvador F, et al. Randomized trial of posaconazole and benznidazole for chronic Chagas’ disease. N Engl J Med. 2014;370(20):1899–1908. Torrico F. E1224 results of proof of concept clinical trial in patients with chronic Chagas disease. In: Proceedings of 62nd Annual Meeting of American society of Tropical Medicine and Hygiene; November 13–17, 2013; Washington, DC. Pereira IR, Vilar-Pereira G, Marques V, et al. A human type 5 adenovirus- based Trypanosoma cruzi therapeutic vaccine re-programs immune response and reverses chronic cardiomyopathy. PLoS Pathog. 2015;24; 11(1):e1004594. Fabbro DL, Streiger ML, Arias ED, Bizai ML, del Barco M, Amicone NA. Trypanocide treatment among adults with chronic Chagas disease living in Santa Fe city (Argentina), over a mean follow-up of 21 years: parasitological, serological and clinical evolution. Rev Soc Bras Med Trop. 2007;40:1–10. Bahia MT, de Andrade IM, Martins TA, et al. Fexinidazole: a potential new drug candidate for Chagas disease. PLoS Negl Trop Dis. 2012; 6(11):e1870. Pinazo MJ, Espinosa G, Gallego M, Lopez-Chejade PL, Urbina JA, Gascon J. Successful treatment with posaconazole of a patient with chronic Chagas disease and systemic lupus erythematosus. Am J Trop Med Hyg. 2010;82:583–587. Urbina JA. New advances in the management of a long-neglected disease. Clin Infect Dis. 2009;49:1685–1687. Garcia-Alvarez A, Sitges M, Pinazo MJ, et al. Chagas cardiomyopathy: the potential of diastolic dysfunction and brain natriuretic peptide in the early identification of cardiac damage. PLoS Negl Trop Dis. 2010; 4(9). pii: e826. Saravia SG, Haberland A, Bartel S, et al. Cardiac troponin T measured with a highly sensitive assay for diagnosis and monitoring of heart injury in chronic Chagas disease. Arch Pathol Lab Med. 2011;135:243–248. Mello RP, Szarf G, Schvartzman PR, et al. Delayed enhancement cardiac magnetic resonance imaging can identify the risk for ventricular tachycardia in chronic Chagas’ heart disease. Arq Bras Cardiol. 2012;98:421–430. Regueiro A, Garcia-Alvarez A, Sitges M, et al. Myocardial involvement in Chagas disease: Insights from cardiac magnetic resonance. Int J Cardiol. 2011;165:107–112. Perez-Ayala A, Perez-Molina JA, Norman F, Monge-Maillo B, Faro MV, Lopez-Velez R. Gastro-intestinal Chagas disease in migrants to Spain: prevalence and methods for early diagnosis. Ann Trop Med Parasitol. 2011;105:25–29. Silva LC, Vicentine FP, Herbella FA. High resolution manometric findings in patients with Chagas’ disease esophagopathy. Asian Pac J Trop Med. 2012;5:110–112. Pinazo MJ, Lacima G, Elizalde JI, et al. Characterization of digestive involvement in patients with chronic T. cruzi infection in Barcelona, Spain. PLoS Negl Trop Dis. 2014;8(8):e3105. Gascón J, Albajar P, Cañas E, et al. [Diagnosis, management and treatment of chronic Chagas’ heart disease in areas where Trypanosoma cruzi infection is not endemic]. Rev Esp Cardiol. 2007;60(3):285–293. Published in Spanish and English. Pinazo MJ, Cañas E, Elizalde JI, et al. Diagnosis, management and treatment of chronic Chagas’ gastrointestinal disease in areas where Trypanosoma cruzi infection is not endemic. Gastroenterol Hepatol. 2010;33(3):191–200. Pérez-Molina JA, Rodríguez-Guardado A, Soriano A, et al. Guidelines on the treatment of chronic coinfection by Trypanosoma cruzi and HIV outside endemic areas. HIV Clin Trials. 2011;12(6):287–298. Guhl F, Vallejo GA. Interruption of Chagas disease transmission in the Andean countries: Colombia. Mem Inst Oswaldo Cruz. 1999;94(1):413–415. Klotz SA, Dorn PL, Mosbacher M, Schmidt JO. Kissing bugs in the United States: risk for vector-borne disease in humans. Envion Health Insights. 2014;8(Suppl 2):49–59. Cantey PT, Stramer SL, Townsend RL, et al. The United States Trypanosoma cruzi Infection Study: evidence for vector-borne transmission of the parasite that causes Chagas disease among United States blood donors. Transfusion. 2012;52:1922–1930. Alarcon de Noya B, Diaz-Bello Z, Colmenares C, et al. Large urban outbreak of orally acquired acute Chagas disease at a school in Caracas, Venezuela. J Infect Dis. 2010;201:1308–1315. Coura JR, Dias JC. Epidemiology, control and surveillance of Chagas disease: 100 years after its discovery. Mem Inst Oswaldo Cruz. 2009; 104(1):31–40. Shikanai-Yasuda MA, Marcondes CB, Guedes LA, et al. Possible oral transmission of acute Chagas’ disease in Brazil. Rev Inst Med Trop Sao Paulo. 1991;33:351–357. Alonso-Vega C, Billot C, Torrico F. Achievements and challenges upon the implementation of a program for national control of congenital Chagas in Bolivia: results 2004–2009. PLoS Negl Trop Dis. 2013;7:e2304. Luquetti AO, Dias JC, Prata A. Diagnosis and treatment of congenital infection caused by Trypanosoma cruzi in Brazil. Rev Soc Bras Med Trop. 2005;38(Suppl 2):27–28. Sosa-Estani S. Congenital transmission of Trypanosoma cruzi infection in Argentina. Rev Soc Bras Med Trop. 2005;38(Suppl 2):29–32. Pan American Health Organization (PAHO). Consultation on Congenital Chagas Disease, Its Epidemiology and Management [OPS/DPC/CD/301/04]. Washington, DC: PAHO; 2004. Munoz J, Coll O, Juncosa T, et al. Prevalence and vertical transmission of Trypanosoma cruzi infection among pregnant Latin American women attending 2 maternity clinics in Barcelona, Spain. Clin Infect Dis. 2009;48:1736–1740. Requena-Méndez A, López MC, Angheben A, et al. Evaluating Chagas disease progression and cure through blood-derived biomarkers: a systematic review. Expert Rev Anti Infect Ther. 2013;11(9):957–976. Sicuri E, Munoz J, Pinazo MJ, et al. Economic evaluation of Chagas disease screening of pregnant Latin American women and of their infants in a non endemic area. Acta Trop. 2011;118:110–117. Huprikar S, Bosserman E, Patel G, et al. Donor-derived Trypanosoma cruzi infection in solid organ recipients in the United States, 2001–2011. Am J Transplant. 2013(9):2418–2425. Jackson Y, Dang T, Schnetzler B, Pascual M, Meylan P. Trypanosoma cruzi fatal reactivation in a heart transplant recipient in Switzerland. J Heart Lung Transplant. 2011;30(4):484–485. Piron M, Verges M, Munoz J, et al. Seroprevalence of Trypanosoma cruzi infection in at-risk blood donors in Catalonia (Spain). Transfusion. 2008;48:1862–1868. Frank M, Hegenscheid B, Janitschke K, Weinke T. Prevalence and epidemiological significance of Trypanosoma cruzi infection among Latin American immigrants in Berlin, Germany. Infection. 1997;25:355–358. Kirchhoff LV, Gam AA, Gilliam FC. American trypanosomiasis (Chagas’ disease) in Central American immigrants. Am J Med. 1987;82:915–920. Steele LS, MacPherson DW, Kim J, Keystone JS, Gushulak BD. The sero-prevalence of antibodies to Trypanosoma cruzi in Latin American refugees and immigrants to Canada. J Immigr Minor Health. 2007;9:43–47. Gascon J, Vilasanjuan R, Lucas A. The need for global collaboration to tackle hidden public health crisis of Chagas disease. Expert Rev Anti Infect Ther. 2004;12(4):393–395. Tarleton R, Gürtler RE, Urbina J, Ramsey J, Viotti R. Chagas disease and the London declaration on neglected tropical diseases. Plos Negl Trop Dis. 2014;8(10):e3219. World Health Organization (WHO). Accelerating work to overcome the global impact of neglected tropical diseases – a roadmap for implementastion. Geneva, Switzerland: WHO; 2012. Available from: http://www.who.int/entity/neglected_diseases/NTD_RoadMap_2012_Fullversion.pdf. Accessed April 22, 2015. Chagas Disease Coalition [homepage on the Internet]. Available from: http://blogs.plos.org/speakingofmedicine/2013/10/31/declaration-of-the-global-chagas-disease-coalition/. Accessed April 20, 2015.